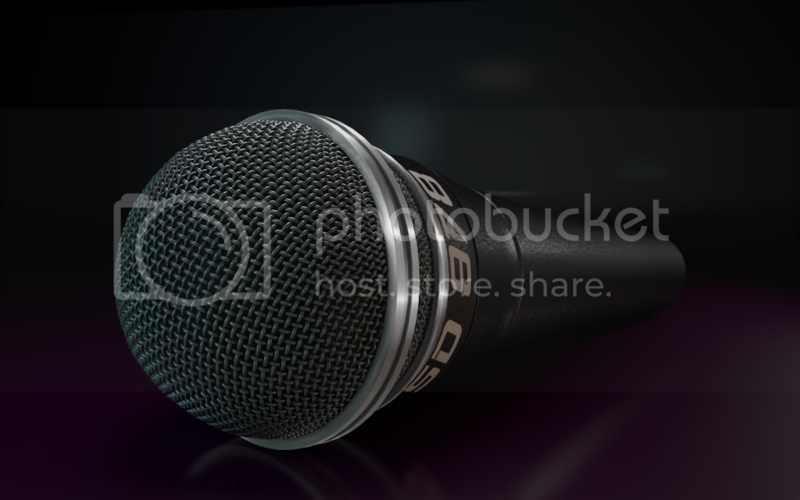 In this tutorial, I will show you how to render the microphone that Chris showed you how to model in the last tutorial. First, we will go through how to texture the model and adjust the reflection details. Then, we will use Light Kit Pro to light the microphone using a simple two light setup. Finally, we add Depth Of Field using the Physical Renderer and prepare our image for the final render. Hey Nick – to Rotate the microphone once you’ve placed it – select the Mic Null and just hit ‘W’ to change your axis from object to World orientation (it’s that button right next to xyz at the viewport top) – in world mode, your axis gimbal will be straight up and down – assuming you haven’t moved your workplane. Hitting W again toggles you between object and world orientation. @ Evan – Thanks for the tip! You guys make a great team! @ Nick I really appreciate you talking about design theory and while teaching lighting. You were talking a lot about the WHY we want to do things. Always a great reminder! Best cinema 4d tutorials I have ever seen, thank you guys. Hello Nick I’ve a challenge for you! You may have noticed how it’s easy to find a bunch of fantastic tutorials about 3Dmax + vRay, in other hand, we only have a few ones involving C4D and vRay, especially in the area of materials. I’ve found a lot of fantastic renders of wood and i’ve been trying get the same results in C4D, however i’m not getting even close. So, what about a tutorial about renderind wood in cinema + vray? Yes… a Vray Tutorial would be awesome! Vray tut would require a tutorial without his lighting plugin, and it’s been a while since I’ve seen GSG do anything without pushing his plugins…. Seems legit to me! Don’t forget that this is what they do for live, so, they have to promote it! Realistic awesome result after lighting, focusing and texturing part. Thank you both. This was my result…straight out of cinema. I also posted a speed art video of it on my youtube. Giving full credit and links to these tutorials. anyone give me the model without texture please ? Hey Guys i saw this really cool video on youtube. link [https://www.youtube.com/watch?v=FIs5YqzS4Bc]. I can model all of those in this video. I wanted to know how those transitions are made. Just like a “train to aeroplane”. Can anybody help me how to make those object morphing?. Hi, I have a question, it is not about this tutorial, but I don’t know where to create the topic. Is there any way to create a selection based on a alpha chanel without using bump? I want to create a extrude on a sphere following a silhouette. Great job, dudes! Anyway, no offense but… am I the only one that gets sleepy with the tutorials?? Powerful stuff, guys. Really impressive. It takes less than 10 minutes to go into REM mode. Again, thanks, Greyscalegorilla. Great effort and a great tutorial, but if you decrease a little verbiage, the tutorial will be excellent. Thank you for Tutorial! it is a great tutorial! and I want to learn how modeling a mechanical stuff like an engine …. I’m still looking for a tuts that i can learn how to model a car engine or some mechanical elements.